We're approaching the busiest shopping time of the year! Plus, we have recently updated our surveys and our offers. Do you want to get rewarded for helping your friends learn about SR? We want to do something to make referring friends to Sunshine Rewards more exciting. We find that the people who use SR the most are the ones who have friends using it, too. To help you help us, we have increased BOTH the signup bonus AND the referral payouts. What does this mean? 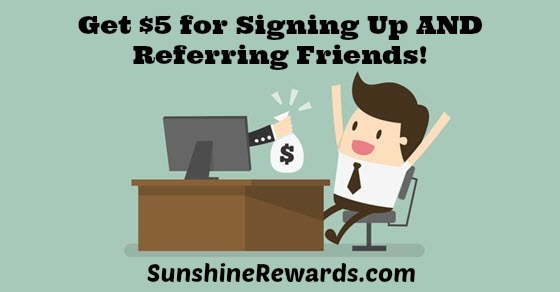 When you sign up as a new member of Sunshine Rewards, you automatically get $5 added to your account (formerly $2). When you refer a friend to Sunshine Rewards and their account hits $10, you get $5 (formerly $2). Two great things about the referrals: 1) Because your friend starts at $5, they only need to earn $5 more for you to get your bonus, and 2) You can refer as many friends as you want with no limits. When you are referring friends, be sure to use the link on the Referral Page and give them your user number so that you get credit!